“The Era of Tolerance Is Over”–Iran Warns over Opposition Protests | Democracy Now! Iranian-Canadian journalist, filmmaker and Newsweek reporter. He was arrested while covering the unrest that followed the disputed presidential elections in June and imprisoned in Tehran for four months. CUNY Distinguished Professor of History at Baruch College and the author of several books on Iran, including most recently A History of Modern Iran. StoryApr 09, 2019Has Trump Locked U.S. and Iran into a “Permanent State of Enmity” by Listing IRGC as Terror Group? JUAN GONZALEZ: We go now to Iran, where tens of thousands of government supporters turned out Wednesday for state-sponsored rallies in cities across the country. Some demonstrators chanted “Rioter hypocrites must be executed!” and “Death to Mousavi!” referring to opposition leader Mir Hossein Mousavi. Hundreds of prominent activists have been arrested since Sunday’s mass street protest, including the sister of Nobel Peace laureate Shirin Ebadi. Opposition websites say at least 1,500 have been arrested, but Iranian authorities put the number closer to 500. AMY GOODMAN: In a minute, we’re going to be talking about what’s happening in Iran, but first we’ll go to break. And then we’ll look at the case, in this last day of 2009, of a Haitian community activist here in New York who’s about to be deported. We’ll speak with the minister of the Riverside Church, who is advocating for him to stay, as well as his wife, who’s at home here in New York with their three children. This is Democracy Now! We’ll be back in a minute. We look at what’s happening today in Iran. The number of people who were killed Sunday is in dispute, with opposition websites claiming thirty-seven dead, the Iranian government acknowledging eight deaths. Among those killed was opposition leader Mousavi’s thirty-five year old nephew, Ali Mousavi, who was buried on Wednesday. Meanwhile, the Washington Post reporting the Obama administration is preparing targeted sanctions against discreet elements of the Iranian government, including those involved in the deadly crackdown on Iranian protesters. For more on the unrest in Iran, we’re joined now by two guests. Here in New York, Ervand Abrahamian is with us, a CUNY Distinguished Professor of History at Baruch College, author of a number of books on Iran, his most recent, A History of Modern Iran. Maziar Bahari is with us, as well, an Iranian-Canadian journalist, filmmaker and Newsweek reporter. He was arrested while covering the unrest that followed the disputed presidential elections in June and imprisoned in Tehran for four months. He was released in October and joins us now on the phone from London. Let us begin with you. As you come out of jail, released in October, can you talk about what is your understanding, Maziar Bahari, of what is happening right now in the streets of Iran and in the prisons there? Well, I think the first thing that I noticed when I came out of prison was that Iran was not a clerical state anymore. Iran is moving toward a military dictatorship. The Revolutionary Guard, who are in charge of — who want to become in charge of Iran at the moment, they have taken over all the strategic positions in the country, including the nuclear program, and they want to establish a military dictatorship in Iran. I think they will fail in the long run. But in the process of creating this military dictatorship, there will be much violence, bloodshed, and there will be many victims. What we witnessed a few days ago in Tehran and other cities is just the beginning of the end of the Islamic Republic as we know it, or even maybe as the government [inaudible]. And what do you make of the government’s efforts to mobilize its supporters and bring them out into the streets, as it has now attempted to do? Well, I think the Iranian government, both before the revolution and after the revolution, whenever they lost their legitimacy, their popular legitimacy, they resorted to gather paid supporters. I mean, when you look at newspapers before the revolution, you can see that even three months before the Iranian revolution there were many gatherings in support of the Shah. And people were —- you know, there were reports of -— they were calling the revolutionaries the rioters and the agents of the black imperialism. And right now it’s the same thing happening, that the government, from my sources in Iran — I [inaudible] to some people in Iran yesterday and today, and they said that there were many buses of people from different cities around Iran, came to Tehran in order to have this gathering of the government supporters. They shut down all government offices. The Tehran metro was free yesterday for the demonstrators. So the government really tried hard to show that it’s still a legitimate popular government, which it’s not anymore. And one of the reasons is that the government — people think that this government is not even a religious government anymore. Explain how you were picked up and what happened to you in the Evin Prison. Basically, what happened was that I was reporting for Newsweek magazine and I did a film for the BBC and also for Channel 4 News here in the UK, and one morning the Revolutionary Guard came, and they picked me up from my mother’s house. They took me to prison. I was charged with espionage. And in that period of 118 days and twelve hours and fifty-four minutes, I was beaten repeatedly, I was physically tortured, I was psychologically tortured. And it’s a very painful memory that I really don’t like to elaborate on this at the moment. There was an international campaign for my release, as you may have witnessed in New York. Different media colleagues, especially people in Newsweek magazine and Washington Post Company, campaigned for me. They used all their resources, both in the media and in the diplomatic circles all around the world, to get me out. People in the UK, my wife Paola — she was the heart of the campaign. And I think the rational elements within the Iranian government finally told the Revolutionary Guard that this guy’s more of a liability than an asset for us in prison, so let’s get him out of jail as soon as possible. I’d like to bring Professor Ervand Abrahamian into the conversation. Your sense of how the Obama administration has been dealing with these protests, the democracy protests in Iran now? Well, I think they started off on a good footing. They wanted to distance themselves, really, from the problems in Iran and focus on the nuclear issue. Unfortunately, as time has gone on, they have got more and more involved in the internal issues in Iran, which doesn’t help the reform movement in the country, because it immediately gets associated with the past, with British, American involvement. So, although it’s very tempting, I think, in Washington to speak out or in favor of human rights, it doesn’t really have the right effect in Iran. It would be better, in fact, to leave human rights issues to human rights organizations and really focus on Iran-US relations, especially on the nuclear issue. What do you think it’s most important for people around the world to understand, what’s happening right now in Iran and how this fits into the history of resistance in Iran? Well, the form it’s taking is a long tradition in Iran, that when there is opposition, the main way is to resort to the streets. It’s as American as apple pie. I mean, protest, crowding, it’s been since 1890s this has been the main way. But one thing to remember is, these protests only succeed when they’re accompanied by strikes, general strikes, bazaar strikes, oil strikes, nationwide strikes. And that’s what brought down the nineteen — the Shah’s regime. So far, the demonstrations have not grown into strikes. So it’s, I think, premature to see the regime as it is on its last legs until we actually see strikes. We have to be careful about writing an obituary of the regime. And is that because the Iranian government still maintains firm control over the labor movement in the country? Or is there a strong labor movement within the country? Well, I think the state itself is very powerful. It administrates. It also controls, of course, the oil revenue. It controls the means of violence. It has a patronage system. All these things don’t win it friends, but it can actually, in a way, forestall strong opposition. And I would say there is also some support for the regime. We shouldn’t minimize that. There is, in the Iranian public, I would say about 25, 30 percent of the population is evangelical — not very different from the US public. And evangelicals would be looking at Ahmadinejad as a person who expresses their sort of both working lower-class and also religious sentiments. Yes, go ahead, Maziar Bahari. I would like to make three comments about Professor Abrahamian’s comments. One thing is that I disagree with Professor Abrahamian about President Obama’s stance on human rights in Iran. I think it was the right thing to do for the President to talk about human rights in Iran, because many of the Iranian people, they thought that there is a secret deal going on between the Obama administration and the Iranian government on the nuclear issue, whereby American government is going to be quiet about human rights abuses in Iran, and then the Iranian government will make some sort of compromise on the nuclear issue. And in Iran, as you know, the [inaudible] and the perception of reality is sometimes much more important than the reality itself. And as Professor Abrahamian rightly said, Iranians have a very bad memory of Western intervention in Iran, especially the American intervention in the 1953 coup, and they thought that the silence of the United States is a continuation of that intervention and not a president’s war. 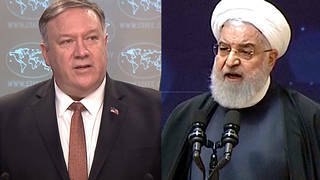 But I think what the President should do now is to talk about the violence against the Iranian regime and condemn the violence against the Iranian regime as much as the violence by the Iranian regime. The danger right now in Iran is that many young people in Iran, as you know there are — Iran is one of the younger — has one of the youngest populations in the world. They are being attracted to violent groups, violent separatist groups, violent terrorist groups, who basically had nothing to say before the June elections, and even before Ahmadinejad’s election in 2005. And many prominent reformists in Iran, they are really afraid of the violence on the streets by the anti-government demonstrators. And I think the President really should condemn that kind of violence against the Iranian regime. The other point that I totally agree with Mr. Abrahamian is that the demonstrations in Iran will not succeed unless the farmers and workers join the students and the middle classes who have come to the streets. At the moment, we don’t see that much economic demand. The economic situation is getting worse because of Ahmadinejad-Khamenei’s mismanagement of the Iranian economy, but they still have some money. They still have access to resources. And there are not economic demands raised on the streets of Iran. But I think in a few years time, even maybe earlier then that, we will see farmers and workers joining the demonstrators, and then I think the regime will be getting really worried, and then I think we can start writing the obituary of the regime. Professor Abrahamian, what about that? What about the issue of the reform movement spawning violence of its own against the government and whether that is a positive or a negative development? I agree very much with Maziar. It’s a very negative act. In fact, I would say they’re probably agents provocateurs from the regime that are trying to incite violence, because, that way, then, of course, they can come in and use much more violence on the protesters. The reform movement, from the very beginning, has been very insistent that it’s a peaceful movement. It does not want violence. But the fact is, it’s hard to tell how much it’s emotion. People get angry, especially if they’ve been put in jail, tortured and so on, come out. They get angry. Or how much it’s then even outside organizations that come in and try to trigger off violence. So, in some ways, I agree, it would be very good for a president here to make it clear that he’s against all forms of violence, including people from the opposition using violence on the authorities. Professor Abrahamian, you’re for or against sanctions? Well, I would — in theory, sanctions could be good if they’re used as a last resort. I don’t think we’re there yet for the last resort. What has happened with the nuclear issue is, I think the Obama administration put on the table fairly reasonable offers. At first, the Iranian government accepted it. Then they put a lot of qualifications in. And those qualifications are now being taken as a rejection, and therefore there’s more of a hastening toward sanctions, which is, I think, is a mistake. What I think the administration should be doing is exploring the qualifications and even bringing in other issues, broader issues about Iran’s role in the Gulf, rather than rushing toward sanctions. And what’s really, I think, dangerous now is that the focus in Washington is sanctions itself, without thinking what beyond that. If that becomes the goal itself, it’s basically a slippery slope. Maziar Bahari, your view of sanctions? Well, I think that the sanctions should be smart sanctions, which they are targeted toward the government and especially the Revolutionary Guard finances and banking transactions outside of Iran. Right now the Revolutionary Guard has started to invest money in different countries around the world. We know of their investments in Malaysia, in China, in United Arab Emirates and Russia. I think the American government and the Europeans, they should work with other countries in order to curb those kind of financial transactions. And I think there should be sanctions against buying nuclear technology and whatever is related to nuclear technology to Iran. But I think the President should really stop the sanctions that can hurt Iranian people. What is important to note in Iran is that we need the Iranian middle classes to be rather well off in order to continue this movement, because when the middle classes are becoming poorer, this movement that we are witnessing in Iran, it may subside, and it may go toward the violence, and it may lose its leadership. So I think the sanctions, as Professor Abrahamian said, should be — the sanctions that can hurt the country, that it can be the last resort. And in the meantime, they really have to focus on the banking and financial transactions and the nuclear program, because the worst thing that can happen to Iran is the day when they reach the nuclear technology that they can build a bomb. I don’t mean that the day they will get the bomb they will go and bomb Israel, for example; no, that’s not going to happen. But what will happen is that a nuclear bomb will bolster the confidence of the regime, and especially the Guard, and they will put more pressure on the people inside the country as a result of that confidence. Maziar Bahari, we’re going to leave it there. We want to thank you for being with us, Iranian-Canadian Newsweek reporter, held for four months covering the protests after the elections in June. Ervand Abrahamian, CUNY Distinguished Professor of History here in New York at Baruch College.